There are dozens of terrifying things that could happen to your car. You could get into an accident. Your transmission could fail while driving on a busy highway. Your brakes could start to fail in the middle of a long trip or during inclement weather. In comparison, when your check engine light comes on, you might feel unsettled—but you won’t feel panicked—and as a result, you may choose to delay some important auto repairs your car needs to stay in good condition. The “check engine” light is intimidating when it first comes on—especially if you’re unfamiliar with the mechanics of your vehicle. You know there’s something wrong with your vehicle, but you don’t know what, and that results in anxiety of uncertainty. Typically, this problem isn’t severe enough to disable your vehicle entirely, so you keep driving it. Your emissions system is a complicated feature designed to process waste products and harmful byproducts of your vehicle’s combustion engine, and either convert or emit them safely. If there’s a problem with it, it could interfere with your vehicle’s safety, emission patterns, and fuel efficiency. 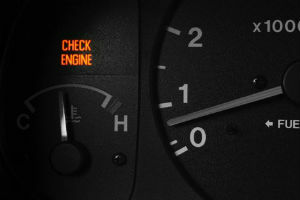 Your check engine light could be warning you that there’s a “general” problem here that needs to be addressed—it could also be referring to individual components, which we’ll cover momentarily. If your check engine light has appeared due to overheating, you’ll probably notice other signs, such as a high temperature gauge or smoking from under the hood. This is a potentially severe problem, so look for the warning signs, reduce your speed, and attempt to reduce your engine temperature by turning on the heat as a release. If this isn’t enough to slow the process, pull over and call for help. Low oil pressure is a common cause of a check engine light turning on, and it can seriously interfere with your car’s performance. Usually, if this is the case, your oil light will also appear. Low oil pressure is often the result of wear and tear in your car’s oil pump, or improper oil change procedures resulting in overfilling or getting air in the pump. In any case, low enough oil pressure will disable your vehicle, so get this repaired immediately. Your oxygen sensor is a piece of equipment that monitors any unburned oxygen that comes out of your exhaust. This is important because it helps your car monitor fuel consumption accurately—if one of your sensors goes out, it could cause the check engine light to come on. You have between two and four sensors in your car, but one missing could reduce your fuel efficiency as well as your emissions, so it’s important to swap in a new one as soon as possible. Letting the problem go too long could damage your catalytic converter, which is a much more expensive repair. Your gas cap may not seem very important, but it is. 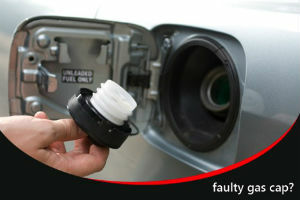 It keeps your fuel from evaporating, which in turn increases your fuel efficiency and reduces your emissions. If sealed improperly, you can correct it on your own. If it’s cracked or damaged, you’ll have to buy a new one (fortunately, they’re relatively inexpensive). If this ends up being the problem your check engine light detects, consider yourself lucky—it can be destructive, but isn’t as severe as the other issues on this list. Your catalytic converter is the mechanism responsible for taking the harmful carbon monoxide gas emitted by your vehicle and converting it into harmless materials. If your oxygen sensors, spark plugs, or other pieces of surrounding equipment start to fail, it can corrupt and eventually ruin your catalytic converter. Fortunately, with regular maintenance, this is rarely an issue—but if you continue to delay the repair, you could end up replacing the whole part, which could cost upwards of $2,000. Spark plugs are pieces of equipment that send a small spark to initially combust your engine. When they start getting old, they can “misfire,” resulting in trouble starting your engine or peculiar jumps in your vehicle’s acceleration. Misfiring spark plugs also trigger the check engine light to appear. Generally, newer spark plugs can last 100,000 miles or more, but older ones need replaced every 30,000-60,000 miles. This is a cheap and easy fix, but the problem will only grow worse with time. Of course, it’s also possible that the check engine mechanism itself is the root of the problem. It may be detecting a problem that isn’t really there, or some loose wire connections may be registering a false positive for the system. In any case, you won’t be able to tell for sure until you have the problem checked at an auto repair center. Don’t assume that your check engine light is just malfunctioning. Auto repairs aren’t fun to think about, but they are necessary to keep your car in healthy working condition. Many of the aforementioned problems will only grow worse if they aren’t addressed in a timely manner, resulting in more damage to your car, less safety for the driver and passengers, and eventually more expensive auto repairs. If your vehicle’s check engine light is on, schedule an appointment with your nearest auto repair center right away to have it assessed.